HI 98143 is a pH and conductivity transmitter designed to accept signals directly from a pH electrode and a conductivity probe at the same time. 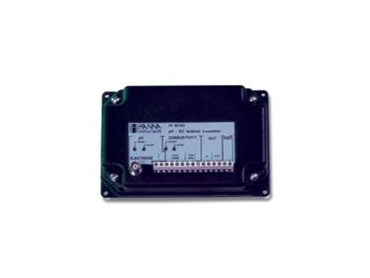 From Hanna , HI 98143 is a pH and conductivity transmitter designed to accept signals directly from a pH electrode and a conductivity probe at the same time. Direct connection of the probes to the transmitter assures a positive electrical connection with no signal loss. This transmitter is most useful in remote process control applications. Four models are available, transmitting a 0-1 V, 0-4 V or 4-20 mA signal. The output signals are proportional to the input signals but independent of changes in load or cable capacitance. Temperature compensation for conductivity measurements is performed by the transmitter's ATC circuitry. The transmitter can be connected to any pH or conductivity controller, recorder, computer or any data monitoring device that accepts 0 to 1 V, 0 to 4 V or 4 to 20 mA input. HI 98143 is an ideal tool for applications that require the monitoring of both pH and conductivity at the same time. The HI 98143-22 model has been specifically designed to be used with the HI 8000 fertigation controllers. All HI 98143 models are supplied complete with instructions. HI 98143-01 with 0-1 V isolated output; HI 98143-04 with 0-4 V isolated output; HI 98143-20 with 4-20 mA isolated output; HI 98143-22 with 4-20 mA isolated output (specific for the HI 8000 controllers).